After being largely absent from the consumer solid state drive market since its inception, Western Digital decided to assert itself into the category three months ago with its WD Blue and WD Green drives, the company's first branded client SSDs. Now it's making a run at the performance sector with its new WD Black SSDs. The WD Black drives are the company's first PCIe SSDs for consumers. They're another option in the fast growing market of gumstick-sized (M.2 2280 form factor) NVMe drives that tap into the PCIe Gen3 x4 bus for faster performance than what SATA 6Gbps SSDs can deliver. "NVMe PCIe-based SSD adoption is poised to accelerate in 2017 and the years to follow," said Jeff Janukowicz, vice president, IDC. 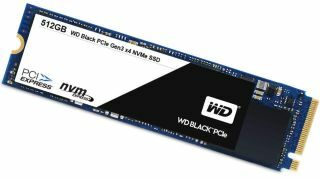 "Products like the WD Black PCIe SSD, with a broad ecosystem and compatibility testing, should give customers a significant performance increase over SATA SSDs and offer a straightforward solution for customers to update to or build future-ready systems." They're solid stats, but not enough to challenge Samsung for the speed crown. Samsung's 960 Evo drives, which are a step down from the 960 Pro line, offer sequential read performance of up 3,200MB/s and sequential writes up to 1,500MB/s (250GB) and 1,800MB/s (500GB). Though WD's Black SSDs aren't quite as a fast, they're less expensive. The 256GB capacity model is available to pre-order for $110 and the 512GB version for $200, which are $30 and $50 less expensive than the 250GB and 500GB 960 Evo SSDs. WD anticipates shipping its new SSDs starting February 14.